Anthropology majors have many opportunities to pursue independent research under the guidance of faculty advisors and to present their findings to audiences within the University and beyond. Apply to the department’s undergraduate research grant, which provides funding for students to pursue original research. Enroll in the advanced topic seminar, an ideal avenue for students to pursue independent research while fulfilling their anthropology major requirements. Complete an honors research project as a part of the honors in anthropology program. Students can also apply to receive funds for research- or conference-related from the department’s travel research fund. Anthropology/philosophy student Dan Brooks, pictured at the water towers near Cobbs Hill Park, received an undergraduate anthropology research grant to put together a paper on graffiti, "Canned Style: The Evolution of FUA and Meanings of Graffiti in Rochester, NY". Conducting research is part of the fabric of the University’s undergraduate experience. 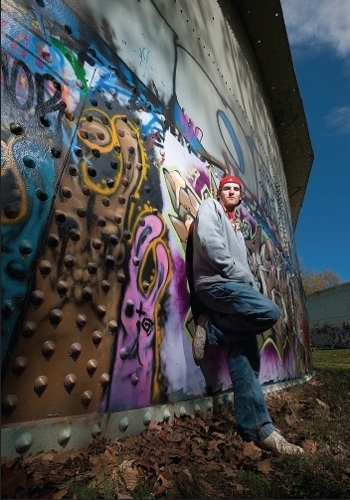 For some students, projects take them into laboratories and libraries, but for Dan Brooks ’10, anthropology research took him out into the City of Rochester to uncover the full landscape of the city’s graffiti scene. He explored the vibrant murals in urban neighborhoods like North Clinton Avenue as well as the not often seen pieces in abandoned subways and street alleys.